The Moluccan Cockatoo has an orangish pink accent in its crest, and a lightly tint on the body! 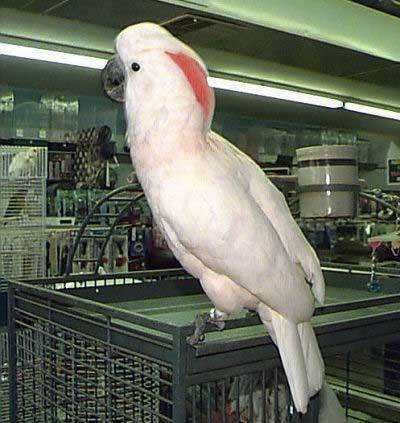 This is a picture of "Colonel", a Moluccan cockatoo that is about 10 years old. He is a mature bird, and this is a normal size for a Moluccan. While "Colonel" was at our store he was a real showpiece, the star attraction for all the visitors. He loved to receive attention and treats, and showed affection for everybody. He was quite the character, always dancing and bobbing, tipping upside down, and begging for interaction. This is typical for cockatoos in general. Both as pets and in the wild, they are very social and always need lots of attention. Distribution: The Moluccan Cockatoo is found in the South Moluccan islands including Caram and Amboina. Description: Moluccan Cockatoos are a full sized cockatoo with pinkish colored feathers on the underside of the crest on the top of their head. Some are pinkish all over while other remain white. They can learn to talk, as can most cockatoos and are easy to teach all kinds of tricks. Cockatoos in general are a very loving type of bird that needs a lot of attention from their owners. Buy a cockatoo only if you can spend a lot of time with it. Care and feeding: A roomy cage is required unless the bird is to be let out for extended periods. Many birds can spend most of their time on a play pen or parrot perch. Moluccan Cockatoos eat a variety of seeds, nuts, fruits, and commercial pellets, as well as the same nutritional foods humans eat. Size - Weight: Mature birds are about 50 cm (20 inches) in length. Social Behaviors: Wild Cockatoos are friendly and peaceful. They live together in flocks of 20 or more birds. Potential Problems: Cockatoos can be quite loud screechers. The behaviour can be reduced by giving attention and proper surroundings. Also, since they are prone to chewing, if they are not given enough attention they will chew their own feathers. Availability: These birds are readily available. Hello dear, My name is zorik and I looking Mollucan Cockatoo baby do you have it?if you have could you send me picture? Want to know the price on them and where would they becoming from? that is a really good site, very informative.